Data from Stürck, J., Poortinga, A., Verburg, P. H., 2014. 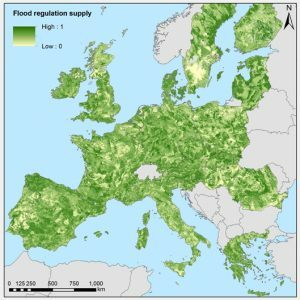 Mapping ecosystem services: The supply and demand of flood regulation services in Europe. Ecol. Ind. 38, 198-211. 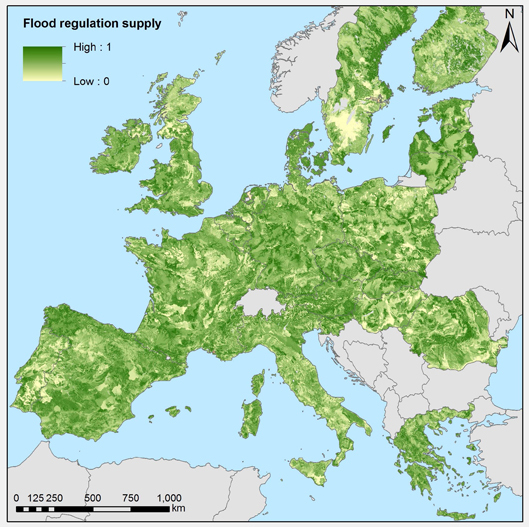 Flood regulation supply is an ecosystem service, which, based on biophysical characteristics of the landscape, supports the mitigation of river floods. The effect of several biophysical factors on the indicator, i.e. land use, precipitation characteristics, type of the river catchment, water holding capacity of the soil, and location, were tested in experiments conducted in the hydrological model STREAM (Aerts, 1999). In each of the selected test catchments, it was tested how the variables affect the runoff volume at the catchment outlet after a rainfall event. The outcomes of the experiment were translated into a dimensionless index (0-1) and applied to Europe based on spatially explicit maps of the variables explored in the experiments, using a look-up table. For the demand indicator, downstream potential flood damages were quantified using the Damage Scanner model (DSM, Bubeck et al., 2011), which uses GDP, land cover, and inundation levels as a basis for estimation of direct flood damages. Flood damage was aggregated for each river catchment, and related to the available upstream area of the entire river basin. Thus, the higher the potential downstream damages, and the smaller the area to provide flood regulation upstream, the higher the demand for high flood regulation supply in the respective river catchment. Demands, expressed as an dimensionless indicator (0-1) are normalized across Europe using a min-max normalization. Aerts, J.C.J.H., Kriek, M., Schepel, M., 1999. STREAM (Spatial tools for river basins and environment and analysis of management options): ‘set-up and requirements’. Phys. Chem. Earth Pt. B 24, 591-595. Bubeck, P., de Moel, H., Bouwer, L.M., Aerts, J.C.H.C., 2011. 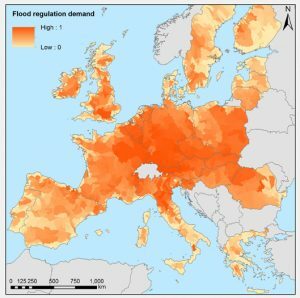 How reliable are projections of future flood damage? Nat. Haz.ards Earth. Syst. Sci. 11, 3293-3306. The datasets have a spatial resolution of 1 x 1 km and reflect the reference year 2000.